...that the Awoken knew the Ahamkara long before the Guardians did? ...that the Traveler's arrival triggered the appearance of the Ahamkara, who are said to have had the power to grant wishes? The Vestian Outpost is a social space located in the Reef. "The fate of those escaping Earth during the Collapse was once unknown. But here drifts a graveyard of lost ships, and among them - the Realm of the Awoken." The Reef is a debris field in orbit within the Asteroid belt in the Sol System and the domain of an expansive Awoken nation under Queen Mara Sov. It is considered by the City to straddle the boundary between the far edge of the Traveler's influence and the unabated darkness beyond the Inner System. The massive hulks of dead Golden Age ships that make up the Reef mark the furthest point that people fleeing Earth and the Inner System during the Collapse were able to reach; the Darkness ensured they made it no further. The early Awoken either arose from or colonized the Reef at some point in the Dark Age, establishing a matriarchal society ruled by a queen and completely independent from the City. Outsiders, including Earth-born Awoken, are considered trespassers and if necessary will be expelled by lethal force. This has changed after the rebellion of the House of Wolves, as Guardians are now welcomed into the Reef to combat the Fallen menace. The Awoken of the Reef have long preferred to remain distant and aloof from the affairs of the City, but are known to be associated with the Nine, who are said to control the planets beyond the asteroid belt. The current Queen allied with the Nine in a successful war against the Fallen House of Wolves. With half their House destroyed, their Prime Servitor missing, and their Kell and Archon sealed within the Prison of Elders, the House of Wolves became vassals of the Queen and lived alongside the Awoken until their rebellion. 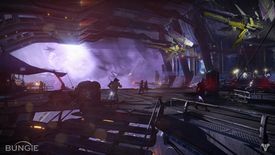 In the aftermath of the uprising, and various thefts by Fallen, the Queen opened the Reef up to the Guardians to fight alongside the Awoken. Though the Dreadnaught was restricted to Saturn, and most of its accompanying fleet annihilated by its own superweapon, hundreds of Seeders nonetheless landed across the Reef, flooding it with Hive and causing widespread damage. The arrival of the Red Legion caused even more devastation in the Reef, facilitated by the supposedly-traitorous Broken Legion (in actuality a Trojan horse) from the Prison of Elders. Raids led by the House of Kings led to further destabilization, forcing Petra to pull back and consolidating the Reef's territory in order to protect civilian life. Years after Mara Sov disappeared from the Solar System, the Reef collapsed from the loss of their armada and security. Taking advantage of this, the imprisoned Fallen House known as the Scorn orchestrated a massive breakout from the Prison of Elders under the leadership of the former Reef prince, Uldren Sov. The Scorn forces fled into the Tangled Shore and Dreaming City under their eight commanding Barons, with Sov being nowhere to be found after the murder of Cayde-6. The situation became so dire that the Guardians were called upon to contain the chaos. Reef society is matriarchal and ruled by a single Queen with near-absolute power, essentially an authoritarian monarchy. The current and only known Queen of the Reef is Mara Sov. Second to the Queen in power is her brother Prince Uldren Sov, Master of Crows, who manages the Reef's intelligence network of "Crows" and serves as the Queen's chief adviser. The Queen commands the military forces of the Reef through seven Paladins. The Royal Armada, consisting of the Reef's space fleet in addition to the Corsairs, who serve as field scouts, and the Vestian Guard, which patrols the Reef's borders, is led by four Paladins. The Royal Army, which encompasses the Reef's soldiers, battle stations, and military installations, is in the charge of two. The seventh Paladin directs the Queen's Guard, which is dedicated to protecting the Queen from both direct threats to her person and indirect threats that endanger the Reef as a whole and therefore the Queen by extension and/or association. Other significant institutions include the Techeuns and the Reef Cryptarchy. The Techeuns, also known as "witches", serve as advisors to the Queen, but following the rebellion of the House of Wolves, two Techeuns now attend her in lieu of Fallen bodyguards. The Reef Cryptarchy's function is similar to the Cryptarchy of the City, but it follows a different philosophy: where the City's Cryptarchs seek to decrypt Engrams to uncover secrets of the Golden Age and aid the Guardians in the process, the Reef's Cryptarchs believe their purpose is to encrypt and safeguard civilization's informational infrastructure. Vestian Outpost—a military outpost guarding the entrance to the Queen's realm. It was opened to Guardian presence in wake of the Wolf rebellion. On Earth, shipwrecks often form artificial reefs, which then become home to a wide variety of life. A number of videos and pieces of concept art indicate that the same process is occurring within the debris field of the Reef. Despite being a matriarchal society, Awoken males are capable of reaching positions of power and respect, such as the Paladins and the Cryptarchy; Hallam Fen and Master Ives being examples. The two destinations in The Reef contain all enemy races as a whole, meaning that it has more races than any other planet or moon in the series, with multiple enemy factions across each. Concept art of The Reef.